Purpose: This extra advanced exercise strengthens and stretches the oblique abdominal muscles, stabilizes the shoulder and puts balance and control to the test! Starting Position: Sit sideways with your weight on one side of the pelvis. Bend the legs and place the top foot over the bottom one. Place your hand, palm down, fingers facing away from you, underneath your shoulder. Your top hand rests on knee. Inhale; In one movement, lift pelvis away from floor, straightening the legs; raise the upper arm to shoulder height; fingers pointing to ceiling. The body is in a straight diagonal line; arms straight & aligned with each other. Exhale, lift pelvis high, reach free arm (top arm) down toward mat, rotating trunk, as the arm reaches under the body. Inhale, return to previous position with the body in a straight diagonal line. Exhale, now, take our arm and reach it back, allowing upper body to twist toward ceiling, resisting pelvic rotation. Inhale, return to your long diagonal position of step 3. Exhale lower body to starting position. Complete 3-5 times. Visualization: Imagine you are suspended by a strong spring attached through your belt loops and up to the ceiling. Begin going in one direction, then add on. Benefits: Strengthens the abdominals, increases spine flexibility, stretches the hamstrings and hip flexors. Starting Position: Lie down on mat and bring your legs up to a 90-degree angle, toes pointed. Arms long by sides, palms down. 1. Inhale; prepare the body and scoop abdominals inward. Exhale; continue to lift your legs up to ceiling (toes to ceiling). Inhale; bring the hands underneath the hips with fingertips pointed outward and the wrists supporting the back and hips. 2. Exhale; scissor the legs; one leg moves over the head as the other leg moves toward the mat in the opposite direction. Switch legs and continue to scissor. Keep the hips and pelvis still as you move legs. 3. Inhale; bring the legs back up over the hips (toes reach to ceiling). Exhale; allow your back to roll down to the mat, slowly and carefully, one vertebra at a time. 1. Lie on your back with hands behind your lifted head; one on top of the other, (not interlaced); elbows wide. 4. Exhale as you raise your straight legs toward the ceiling. Don’t allow the legs to pass 90 degrees; the tailbone does not leave the mat. Complete 8-10 times. To end bring both knees into chest. Purpose: Strengthens abdominals in shortened as well as lengthened positions, stretches hamstrings, articulates spine, and improves posture. Lie on back with your hands layered behind your head, elbows wide. Legs are straight out on mat, hip width apart, feet flexed. head, shoulders, ribs, and finally pelvis. Think of “peeling” yourself up off the mat as you curl forward, elbows wide. Exhale as upper body folds over legs, elbows still wide, abs scooped in, legs firmly anchored on mat, toes pointed up. Inhale to roll up tall to a seated position, as if “pressing against an imaginary wall behind you”. Remember to lift up-not back. Exhale as you slightly tuck your tailbone underneath you and begin slowly rolling your spine, vertebra by vertebra, back down to the mat. Remain fixed in the lower body. Imagine your feet are two lead weights that can’t be budged. Avoid letting abs bulge out or legs rise off the mat. Keep elbows wide; never tug on neck, let the powerhouse do the work. Articulate your spine as you peel off the mat, press each vertebra into the mat on the way down. If you have a stiff or weak back or difficulty articulating through the spine, avoid the exercise. 2. Hand position: crawl your hands up your legs as you round up. Keep knees soft and heels pressed to mat. Purpose: This exercise challenges balance, flexibility, and strength. It massages the spine, stretches the back, and works the powerhouse; plus it’s fun! Sit toward the front of your mat with your knees bent in toward your chest. Open your knees shoulder width and gently take hold of your ankles. Pull your navel into your spine; tilt back slightly until your feet come off the floor and balance on your tailbone. Straighten both legs up to the ceiling in a V position and balance. Keep your arms straight, chest lifted, and eyes focused toward feet. 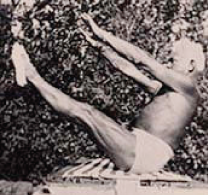 To initiate the ‘rocking’, inhale, pull in your abdominals, curl the tailbone under, and begin to roll back. Roll only to the base of the shoulder blades, head barely touching the mat. Exhale, roll back up to your balance point (tailbone); keep the V shape. Visualization: Imagine rolling your spine against the floor in the same way a wheel rolls smoothly back and forth. Try straightening your legs and balancing without rocking back and forth. Place the hands closer toward the calves (never under the kneecap). For more challenge, hold the toes and roll back or add a fitness circle resistance ring between the ankles. Don’t initiate the movement by tossing your head back. Keep your rhythm—don’t stall at the bottom of the roll. Avoid “whipping” up. Roll up smoothly with strength and control. Don’t roll onto the back of the neck. Pull in your abdominals to rock back and to rock back up. Note: A sensitive tailbone may be further irritated by this exercise.